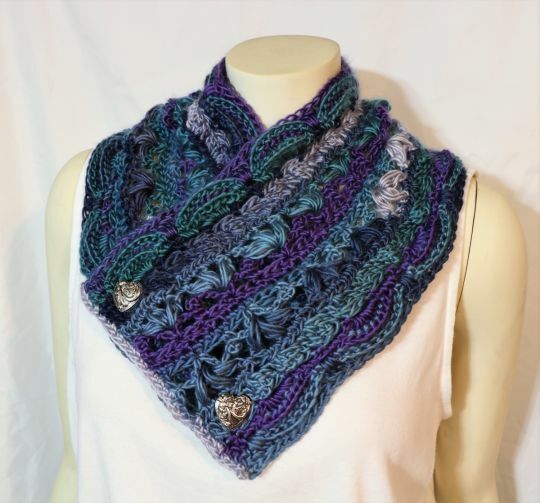 This cowl is has lots of texture and is beautiful. It uses light worsted or DK yarn. If you ever have any questions about my patterns, please feel free to email, or message me. This is designed for an intermediate crocheter, although many advanced beginners would do well. Items made from this pattern may be sold. I just request that you credit me, Donelda Higgins, as the designer. This pattern cannot be sold, transmitted, distributed or reproduced in any form or by any means. This pattern (including its pictures) as well as the pictures used to promote it are copyright protected. Please check out my other designs.